Hey guys. Today I'm linking up with Vodka and Soda for some Humpday Confessions. I have a lot of random stuff going on right now... So here we go! -I feel like the past two weeks have been a giant blur. Without going into too much detail, there may be a big life change coming soon, and I have been a big ball of anxiety-riddled jello. BUT my apartment is really clean. Anxiety does that to me. On the other hand, I can't seem to focus on anything. -Last night Dave and I ordered a 2 medium pizza deal... For the two of us. Sometimes we each want different toppings and I don't want to pick off 6 different things. I didn't feel even a tiny bit guilty about it even when the delivery man gave me the weirdest look when he figured out there was a pizza for each person. -I haven't linked up to a single link party all week. I'm also in the middle of approximately 3 craft projects that I want to post tutorials for. I blame it on jello brain (see above). -I randomly had a huge surge in views on Sunday night. Like more than 3x my normal daily amount. Weird but I'll take it! How is your Humpday? Your week? Any first world problems? They were delish. I finished mine yesterday for leftovers and didn't even feel bad that I had eaten a whole pizza in 2 days. I was stressed on Wednesday due to an important decision I had to make. I'm sorry! I hate that one decision can totally stress you out and affect your whole day or even week. I hope you are feeling less stressed! 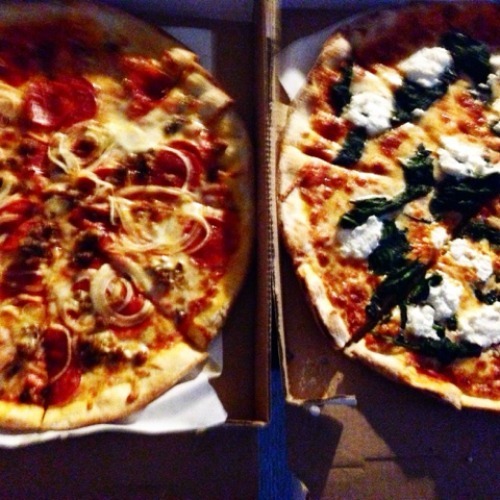 We order two different flavours of pizza on a regular basis. Our local pizzeria has a two-for-one special and the flavours don't have to be the same. Yum. I can swing to extremes when I'm stressed, either I eat too much or I don't eat enough. I hope that you get through this rough patch. Love it! Then you always have leftovers! Thanks, I think things are calming down now. We are about to go home and visit our families for a vacation, so I should have some time to relax. John and I order two different pizzas pretty often depending on what are moods are :D I'm kind of really craving pizza now..
Pizza is my absolute favorite. I've been trying to cut down on gluten, and the only problem is pizza. i make my pizzas now! i never realized how easy it was and i was surprised how different it tastes from when you order it. I definitely need to try that. We get pizza almost once a week. Money down. the. drain.